The other day my modem died and I was suddenly e-adrift. I couldn’t check email, I couldn’t get on the internet, I couldn’t see facebook. What a revelation! I didn’t realize how much time I spent checking email, only to find offers from retailers jamming up my inbox. Folders for the types of email I receive. By setting rules, the emails go directly into the designated folder. You can control how you receive and manage your email. Most email programs allow you to direct your incoming mail to folders other than your inbox. You can decide which messages are important enough to be delivered to your inbox. The others can be delegated to folders you can review later. Make folders for the categories of email you receive. The categories may be messages from a particular sender, messages from an online chat group, retail offers, newsletters, facebook notifications, etc. Next, go to your Tools menu, find Rules and set up parameters that will direct different messages to different folders. For example, you may want all messages from Zappos to go to a Shopping folder. Or, all messages with a Yahoo group in the subject line to a folder for that chat room. By moving messages to folders, you can reduce the clutter in your Inbox. 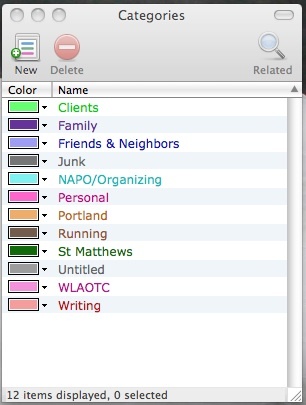 Some email programs allow you to assign colors to categories of contacts. When you open a contact, or click on an email, you can assign a color-coded category. When you open your inbox, your messages will be color coded, allowing you to decide which to open first. Categories for contacts in your address book. You can add categories, create custom colors or change everything! You are receiving retail offers and newsletters because at one time you subscribed. Many times, all you did was set up an online account with a retailer. By law, at the bottom of emailed retail offers and newsletters, in very tiny type, is an option to “unsubscribe” to messages from that sender. Clicking on “unsubscribe” links you to a web page that either tells you that you will no longer receive those messages, or asks you to confirm that you wish to unsubscribe.